When Exxon’s Pegasus oil pipeline ruptured in Mayflower, Arkansas on March 29, it flooded streets and homes in a pretty suburban subdivision with dilbit — that’s “diluted bitumen.” Bitumen is a sticky, heavy precursor to oil; it’s the stuff that is being extracted from the vast tar sands mining operations up in Alberta, Canada. The bitumen is diluted with lighter hydrocarbon liquids that essentially act as solvents so it can flow through the pipeline. A similar pipeline rupture in Michigan in 2010 flooded the Kalamazoo River with dilbit, a substance that — unlike crude oil — sinks rather than floats, making the cleanup significantly more difficult and expensive. The Mayflower cleanup has also been a prolonged and contentious operation, with local residents reporting illnesses in the aftermath, and disagreement about exactly what areas have been impacted. This series of before-and-after pairs of high-resolution images of the Mayflower area yields some clues. The “before” imagery is aerial survey photography from Google Earth that was taken on September 4, 2010. The “after” imagery (provided to us courtesy of Sierra Club Arkansas Chapter) was shot from DigitalGlobe’s Worldview-2 satellite on July 31, 2013, four months after the spill. Some changes are easy to see: large light brown areas of bare soil show where excavation and soil removal occurred; and a notable loss of aquatic vegetation in a cove that empties into Lake Conway. Overview showing area of March 2013 pipeline spill in Mayflower, Arkansas. Left/Before – September 2010 : Right/After – July 2013. Images courtesy of Sierra Club Arkansas Chapter. Detail 1: In the lower-left (next to SkyTruth logo) is the subdivision that was flooded with dilbit during the March 2013 spill. The Pegasus pipeline right-of-way cuts diagonally across the left (west) side of the image; two long driveways at the end of the cul-de-sac at the northwest corner of the subdivision lie directly on top of the pipeline. In the July image (right), light brown patches on north side of the subdivision probably shows area of soil that were excavated and removed as part of the cleanup operations. Oil flowed from west to east, toward Lake Conway. Left/Before – September 2010 : Right/After – July 2013 Images courtesy of Sierra Club Arkansas Chapter. Detail 2: West end of the cove and wetlands where the spill apparently entered Lake Conway. In the after image (right) floating booms (thin, pale light lines) are strung across the cove in attempt to intercept the dilbit. Turbid, open water and very pale green area (newly planted grass?) suggest impact to wetlands and aquatic vegetation in this area. Left/Before – September 2010 : Right/After – July 2013. Images courtesy of Sierra Club Arkansas Chapter. Detail 3: Close-up of the area where cove meets main body of Lake Conway (upper right). More booms are apparent, as are distinct changes in water color that can indicate variations in the presence of turbidity, algae, or other substances. Left/Before – September 2010 : Right/After – July 2013. Images courtesy of Sierra Club Arkansas Chapter. 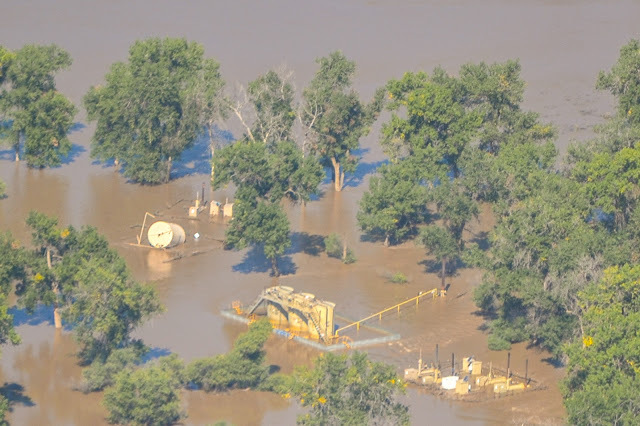 In response to catastrophic floods in Colorado’s Front Range, SkyTruth is launching an online mapping tool to collect reports of damaged oil and gas infrastructure. 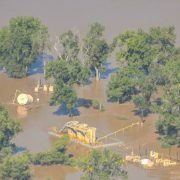 As the floodwaters recede, dozens of photos are emerging of flood-damaged wells and storage tanks. Due to the environmental and public health hazards posed by chemicals used in drilling and hydraulic fracturing (fracking), public health officials and environmentalists are concerned about the contaminants faced by residents returning to flooded homes and communities. 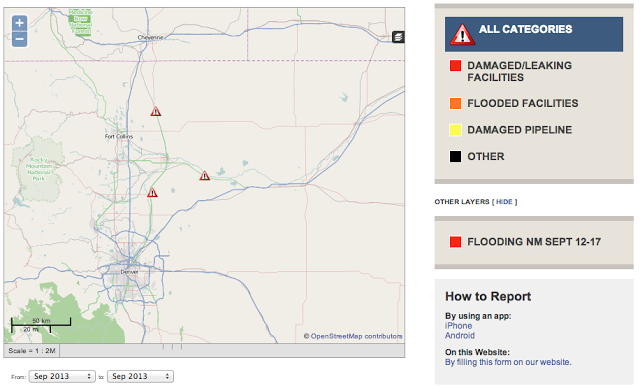 The Front Range Flood Impacts map provides a public webspace for reporting and exploring damage to oil and gas infrastructure, including map-searchable descriptions and photos of leaking chemical tanks, oil slicks, and other evidence of contamination [Citizens are also encouraged to email reports to the Colorado Oil and Gas Conservation Commission]. SkyTruth is making this information freely available to the public and will work to correlate incident reports with fracking chemical disclosures and other oil and gas drilling information. SkyTruth is a 501 (c) 3 non-profit using remote sensing and digital mapping to create a world where all people can see and understand the environmental consequences of human activity everywhere on Earth, and are motivated to take action to protect the planet. SkyTruth documents the environmental impacts of oil and gas drilling through satellite and aerial images, and with resources such as a nationwide database of hydraulic fracturing chemical disclosures. UPDATED – September 13, 2013: Added video trailer for upcoming short video documenting the mission. 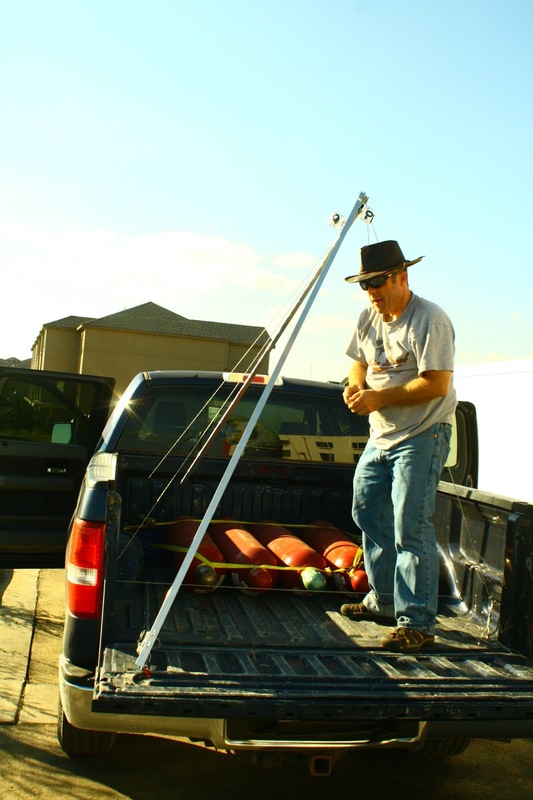 September 3, 2013 – Chicago, Illinois: In partnership with Space For All, and funded by generous support from donors all across the country, SkyTruth recently launched a mission to document natural gas flaring in North Dakota’s Bakken oil shale. We are pleased to announce that our attempt to send an instrument package over the oil fields on a high-altitude balloon was a success, and as we make our separate ways home, we are starting the long process of sifting through the 19.8 gigabytes of video, photos, and sensor data that we collected from the mission. We recorded four hours of HD video from three GoPro video cameras before the devices froze up in the chill of the upper atmosphere, 606 still images from a small, point-and-shoot digital camera programmed to take a photo every ten seconds, and over 400,000 atmospheric readings. Preparation – Aug. 31- late afternoon, Sept. 1: We spent a feverish 24 hours assembling hardware, wiring sensors, troubleshooting software, triple-checking all recording systems, and running flight-path models which seemed insistent that the balloon flirt dangerously close to a large lake just north of the main oilfield. Finally satisfied with a favorable flight path and all hardware loaded up, we rolled out to the Lewis and Clark Wildlife Management Area on the floodplain of the Missouri River – just south of the city of Williston. Our convoy and launch site made quite a scene, with the unwieldy triangular aluminum frame of the payload transported upright from the motel parking lot (above), four large red tanks of compressed hydrogen strapped down tight, and a spread of laptops, radios, and cameras worthy of a TV show. Locals asked us about the rig at the gas station, traffic leaving the wildlife area slowed down passing our launch site, and a curious ranger closing the gates for the day inquired about the large latex sphere billowing from the bed of our beat-up rental pickup truck. 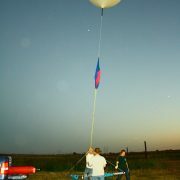 But everyone we talked to was fascinated by the idea of a weather balloon and getting to see the operation in progress. Just before launch, the balloon inflated, parachute fixed between the balloon and the payload (the balloon bursts when it reaches its maximum altitude), and the hydrogen tank to the right. 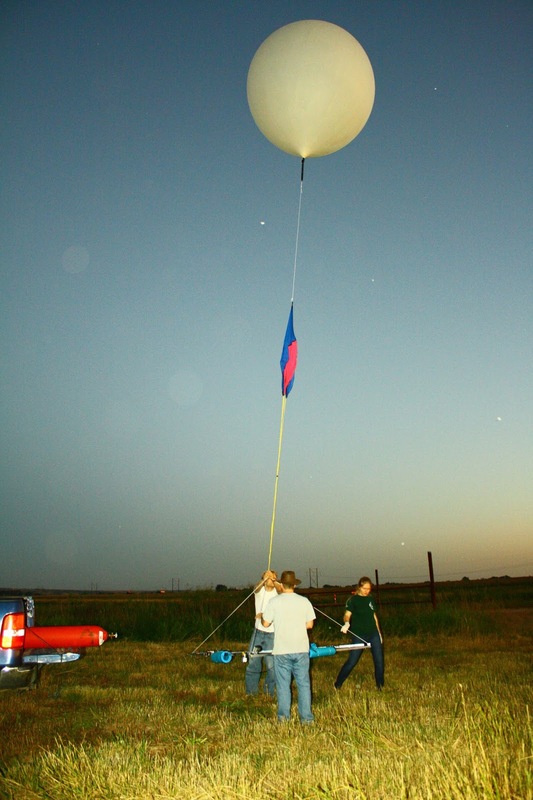 Launch – 8:57 pm CDT, Sept. 1: Astonishingly, we released the balloon a few minutes ahead of schedule, carrying our payload up into the twilight as flights of ducks splashed down in the wetlands around us and oil field traffic roared up and down US Route 84 a few hundred meters away. However, as it soared into the darkening sky, our primary radio tracking system immediately ceased transmitting its location, leaving us with only the projected flight path and our backup satellite-based SPOT transmitter to find the rig when it returned to earth. Our flight predictor estimated a 3.5 hour flight, and a drop point far outside of the active oil field, 131 miles away by road. The Chase – 8:57 pm to 1:15 am: With the balloon away, there was nothing to do but leap in our vehicles and race to the predicted landing zone. As darkness fell, the lights of oil rigs began to stand out in stark contrast to the once quiet wheat fields and pastures. Hurrying south through Watford City, the narrow roads under construction were intimidating because of the endless stream of trucks hauling tankers of oil, loads of fracking chemicals, and oilfield equipment. To the left and right, oil rigs drilled away while natural gas flares burned brightly in the otherwise inky darkness. Continuing run simulations from our smartphones, the winds appeared to calm down, moving our expected landing point south and west of the original prediction. The lead chase vehicle proceeded halfway between the original predicted landing point while another held back at the town of Killdeer, just north of the new predictions. During this time, the satellite transmitter predictably blacked-out, leaving us to wait a nail-biting 110 minutes for any trace of the rig. At 12:21 am CDT, September 2, the satellite transmitter sent a new update, 36 minutes from the lead chase car, but only about 13 miles south of the original projected landing place. Both teams raced toward the latest coordinates, checking on smartphones every 10 minutes for the latest coordinates. As it gently wafted back to earth, Dan Kumor of Space For All and David Manthos from SkyTruth searched back and forth along a desolate road in the middle of pitch black fields for any sign of the payload. Upon receiving two transmissions in the same place, it became clear the rig had landed, and was only about 100 meters from the road. 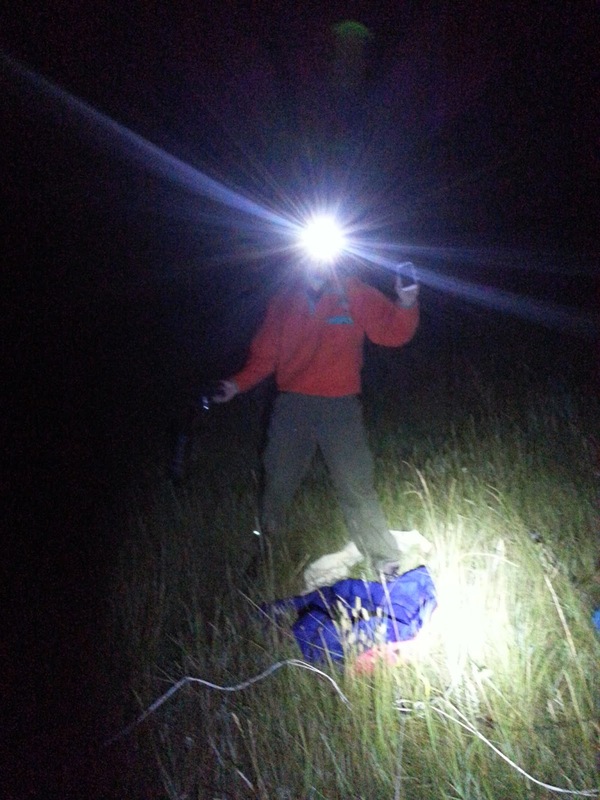 Recovery – 1:15 am, Sept. 2: Following raw GPS coordinates from a smartphone, Kumor and Manthos paced off the latitude and longitude of the transmitter’s location, wading through tall grass right up to the completely intact payload (right) in the middle of a field just south of Zap, North Dakota. Once back at the road and joined by the second recovery vehicle, we pried open the camera cases (in the low-pressure of high-altitude flight, the air even inside a waterproof case can leak OUT, making it difficult to open the now vacuum-sealed boxes). With nervous anticipation we plugged in the camera cards to see what we got. The cameras shutoff after about an hour into the flight, but it appears we captured much of the oil field we were hoping to image. Furthermore, we found that it is indeed possible to piece together a relatively inexpensive experiment like this to get the SkyTruth view on the big picture of environmental impacts like oil shale drilling. We also successfully completed groundtruthing of numerous sites in the Bakken, validating the infrared detections we monitor from NOAA’s Suomi NPP satellite. We have mountains of data to go through, and hours of footage to process, but stay tuned for more updates and news about our final products from this mission. Author’s note: My train departs from Chicago Union Station in 20 minutes and I have to get to the gate. Loading photos has been nearly impossible on the wi-fi here, and video would be impossible. Check back for more photos and raw footage tomorrow! P.S. Apologies for typos and rough grammar on the earlier version of this post. I did not expect to be able to post from the train, and felt we owed an update to all our fantastic donors who made this possible. 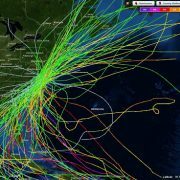 NOAA has a very cool interactive map that allows you to pick a location and show the tracks of all of the known hurricanes that have come near that spot. 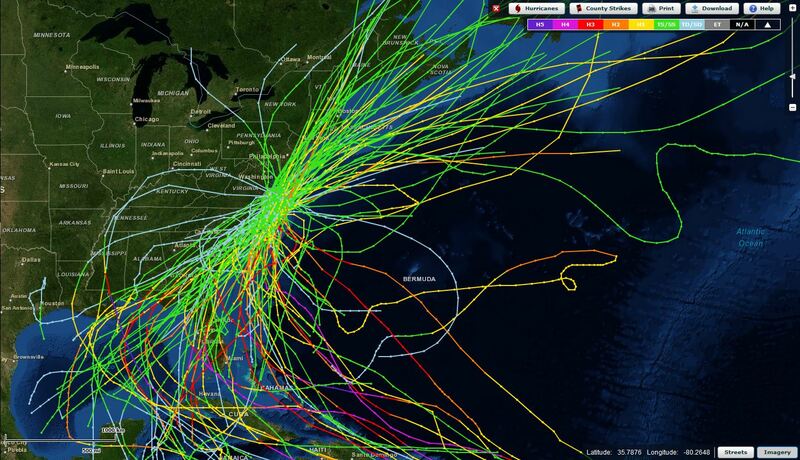 Map showing the tracks of all known hurricanes since 1851 that have come within 65 nautical miles of Virginia Beach. Source: NOAA / Historical Hurricane Tracks. We’ve seen spills again and again from storm-damaged infrastructure on the Gulf Coast, in the wake of Hurricanes Katrina and Rita, Ike, and Isaac. Industry apologists tend to shrug their shoulders whenever these spills occur and say “Hey, whattaya gonna do?” But these so-called acts of God are entirely predictable, from the perspective that severe storm events are a regular, expected part of life along the Gulf and Atlantic seaboards. Just spend some time with NOAA’s interactive map. It’s an eye-opener.